VASSAR TEMPLE STEPS UP TO THE PLATE! This morning, Vassar Temple caught wind of an immediate need for food donations on behalf of the students at Morse Elementary School in Poughkeepsie. It seems as though a large number of families associated with the school lack adequate food year round. With the December holiday break at hand, it was anticipated that many students would lack access to school-based breakfasts and lunches. 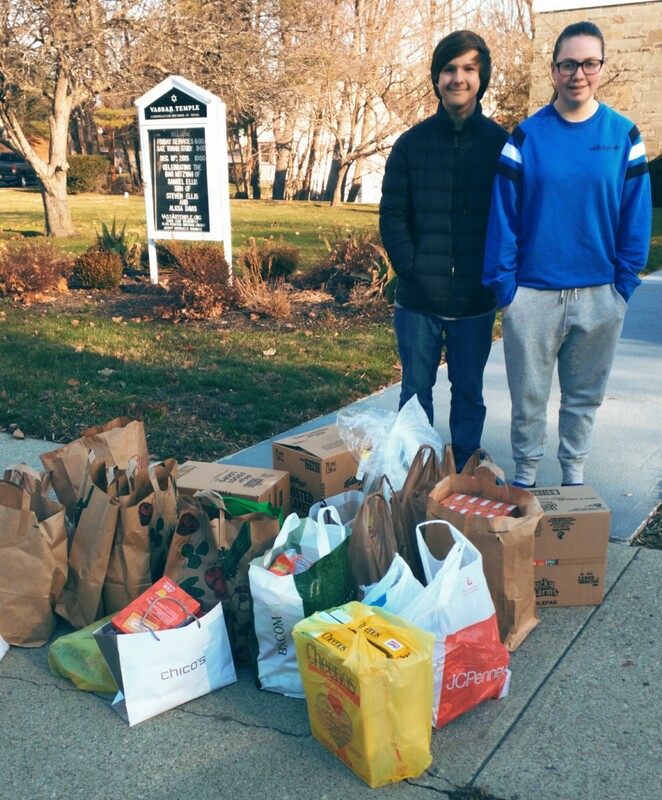 The school, which houses its own food pantry, was in need of donations! This morning at Temple, our marvelous teens Edison D’Orio and Tara Lerman helped bag canned and nonperishable foods that you, Vassar Temple members, had generously donated in the recent weeks to our VT CAN JAM bin. Cereals, lentils, soups, pastas, juices and more ~~ amazing!! Together we loaded up a car full of bags. Tomorrow the food will be delivered to the Morse School — just in time for the winter break. Thank you Vassar Temple. NOTE TO READERS: THESE NOTES SHOULD BE READ IN CONJUNCTION WITH PLAUT’S THE TORAH A MODERN COMMENTARY. “RB” IS RABBI BERKOWITZ – THE LEADER OF OUR DISCUSSIONS. ALL ERRORS ARE MY OWN. COMMENTS ARE WELCOME. L. LEWIS. p.277 Overview of this parsha by RB: In our last portion Joseph was in jail and forgotten. Then Pharaoh has a dream about ears of corn and cows. Why are there two iterations of the same story? Showing us the impact of famine on animal and vegetable? Joseph interprets seven years of plenty and seven years of famine. Pharaoh is impressed and chooses him to manage the process of building a reserve. Meanwhile back in Canaan there is famine and the brothers are sent to Egypt to buy food. Joseph recognizes them but they don’t recognize him. He interrogates them and sends them back with food but returns their money by putting it in their bags. See page 271 for the translation of Joseph’s Egyptian name. Note the evolution of Judah’s character as a human being throughout. 16 – The brothers enter Joseph’s house. They tell his houseman of the silver in their bags. They are told that “their god” replaced the money. Note the presumption of tolerance. The houseman knows that Joseph is a Hebrew but the brothers are unaware. Discussion of the merits of polytheism – particularly where woman had their own female deities. Some historians identify monotheisms as the greatest tragedy in the history of mankind! Note the modern female priestess movement. Particularistic religion vs universalist. Jews are particular in that they have their god but unlike Islam and Christianity they do not proselytize. There is no effort to make the religion universal. Note the Pope’s recent encyclical on the Jews – not to be proselytized by Catholics – in recognition of the validity of Judaism. 24 When Joseph enters they bow down before him. He asks for their aged father. He sees Benjamin – his mother’s son. He weeps in an inner chamber and eats separately – because of his rank? Or because of his emotional state? Note that the word for “abomination” is used later to describe homosexual acts. To eat with people of another culture is also considered taboo to an Egyptian of this era. This is all believed to be a separately written piece – it is emotionally rich. Consider the musical – Joseph and His Coat of Many Colors – much of which is taken directly from Torah. This is thought to be from the “J” author but there are likely other contributors. Joseph assumes that Benjamin may now be the favorite son – since Rachael is their mother. 33: They were seated before him – ate and drank. Now he again secretly returns their silver and this itme puts a silver goblet in the bag of Benjamin. Joseph is testing the brothers. 33: 14 ” Did you not know that a man like me practices divination.” J tries to separate out Benjamin again. But Judah offers all of them as slaves and implies that they all conspired to take the goblet. Have they perhaps recognized J and are “playing along” knowing that he would treat them mercifully? Theologically this is about forgiveness and the spiritual growth of human beings. Taking responsibility for ones sins. PC- There is a running theme here of “my god is better than your god.” Joseph derives his power from his God – apparently. But there is also the theme of forgiveness – not to mention that Joseph has saved the Egyptian people from starvation. Intelligence and charisma is its own reward. This was all part of God’s plan according to Joseph. CL This can be read as a miracle story which were very common in ancient cultures. It was very difficult to preserve food so the outcome was effectively miraculous. Cross-posted to This Is What a Rabbi Looks Like. My sermon in response to recent acts of gun violence. With thanks to Rabbi Rebecca Reice, who originally explained to me the concept of tam and mu’ad. I didn’t want to talk about gun violence tonight. I actually started writing another sermon, one connecting the Torah portion to a book I was reading, which is one of my favorite ways to preach. But even as I wrote, there was a nagging feeling that I should be writing about the incidents in California and Colorado Springs this past week. I pushed the urge down, saying to myself that it’s too controversial to discuss this so early in my tenure here. That I’m too busy this week to do the topic justice. That I’m just not ready. And then I heard myself say, “Finish the sermon you were writing. There will be another shooting. It’s not like you’ll miss your opportunity.” And that thought was too much for me to bear. Three years ago, almost to the week, I stood on the bimah in North Carolina and mourned for the young victims of the Sandy Hook Elementary shooting. Our parasha, like this one, was from the Joseph narrative, and I spoke about Jacob’s perceived loss of his son and the unimaginably terrible pain of losing a child. I urged my community to take action to prevent future massacres. And I prayed, quite fiercely, that I would never have to give a sermon like that again. It isn’t one particularly earth-shattering tragedy that has pushed me to speak this evening, the way the Sandy Hook shooting did three years ago. It is not that one of the recent shootings targeted a women’s health clinic, which touches on issues close to my heart. It is not even that, despite all their prayers and statements of support, our lawmakers failed to pass any sensible gun legislation in the wake of these attacks. It is that there have been so many shootings in the last year that I no longer even feel the need to click on the headlines. There have been 12,236 deaths from gun violence in 2015, and nearly twice that number of gun-related injuries. And the year is not over. The British journalist Dan Hodges put it best when he said: “In retrospect Sandy Hook marked the end of the US gun control debate. Once America decided killing children was bearable, it was over.” Gun violence has become the white noise in the background of American society. And that is unacceptable. Lamentation is a timeless and appropriate Jewish response to senseless destruction. But that is also not enough. Our tradition demands that, when our fellow human beings are in danger, we take action. This is not a left or right issue, or at least, it shouldn’t be. This is a human issue. This is an American issue. And this is a Jewish issue. This is a Jewish issue, not because the Bible preaches non-violence. The Bible is loaded with violence. It is not a Jewish issue because the Bible advocates peace and tolerance. The Bible demands war and conquest and the smashing of foreign idols. This is a Jewish issue, because the Bible is a book that demands the taking of responsibility, as individuals, and as a community, for that which has the potential to do harm. And strangely enough, we learn this from the Torah’s teachings on animal husbandry. We read in Exodus that if an ox gores a person, the ox is put to death, and the owner is not held accountable. However, if the owner was previously aware that the ox was a danger to human beings, the owner, too, would be put to death, because the owner did not protect people from an animal the owner knew to be dangerous (Ex. 21:28-29). This leads to a discussion in the Mishnah about how we interact with animals that are safe (tam) verses animals that are known to be dangerous (mu’ad). The distinction is important, because if an animal is mu’ad, its owner is responsible for keeping it from causing people harm, and held accountable, even to the point of capital punishment, if that animal hurts someone. The rabbis ask: What is a tam [animal], and what is one which is mu’ad? “A mu’ad [animal] is any one about which people have given testimony for three days. And a tam one is that which has refrained [from doing damage] on three days,” the words of R. Judah. R. Meir says, “A mu’ad animal is one against which people have given testimony for three times. And a tam one is any which infants or nurslings can touch without its goring them” (M. Bava Kamma 2:4). Some species of animal are always considered mu’ad, unless they can be trained, while others are considered mu’ad only for certain behaviors that are typical to their species: kicking, pushing, or eating something it is known to eat (M. Bava Kamma 1:4). A firearm may not be an animal. But a firearm is, without question, mu’ad. Firearms have not gone three days without doing damage. In fact, only 336 days into the year, there had been 355 mass shootings, more than one for every day of the year. On Wednesday, the day of the San Bernadino shooting, there was also a shooting in Savannah, GA, which killed one woman and injured three men, and barely made the news. Firearms are not something a child can touch without injury. A study by the Harvard School of Public Health and the University of Vermont finds that 110 children under 14 are killed accidentally by guns each year, while another study estimates that seven children and teens are shot to death each day, whether accidentally or on purpose. And unlike a mu’ad animal, guns are only tam, safe, in the most particular of circumstances: in the right hands, with the proper training, and with every possible safety measure. And unlike a mu’ad animal, which might be used for agriculture or transportation, a firearm, particularly an assault weapon, does not have any purpose other than to kill living beings, specifically humans. This does not mean that there is no place for gun ownership in our society, though I personally wish that I lived in a world where gun ownership was rare. Something mu’ad is not something that cannot exist and must be destroyed. Rather, it is something that must be contained and regulated in order to ensure public safety. And if that cannot be accomplished, the owner of that which is mu’ad is held responsible for the damage caused. As they conclude their conversation about which animals are tam and mu’ad, the rabbis say something chilling: A human being is always mu’ad, whether s/he causes damage unintentionally or intentionally, whether awake or asleep. If a person blinds another person’s eye or breaks another person’s property, s/he pays full damages (M. Bava Kamma 2:6). This tells us something heartbreaking that we probably already knew about ourselves: we can be dangerous, and we frequently hurt others. But this passage also reminds us of something vitally important. We are responsible for the damage we cause even when it is unintentional. We are responsible even when our eyes are closed. We are responsible even when we don’t click on the headline. We often say that guns don’t kill people, people kill people. But we must amend that. People who make it easier for dangerous people to obtain guns kill people. We may not own firearms ourselves, or we may own them and care for them in a safe and law-abiding manner. We may not provide firearms to others. But we are citizens of this nation, where the gun murder rate is 20 times that of any other developed country. We are citizens of a nation where, even in the wake of 20 children being shot in their elementary school classrooms, an assault weapons ban could not be passed in our Senate. We are citizens of a nation where, even after five mass shootings in a seven-day period, no legislation regarding background checks could even be discussed. If we knowingly allow this epidemic of gun violence to continue, when we have the power to stop it, we are just as responsible as the person who is pulling the trigger. We know that we are mu’ad. We cannot neglect our responsibility to protect people from harm. I will not say definitively what each of us needs to do. We are a politically diverse community, and I know that we differ in our opinions about the root of this problem. I will only say that, as Jews, we cannot do nothing. We must hold ourselves accountable, and we must hold our government accountable as well. If we believe that this is a mental health issue, we must demand increased funding for inpatient and outpatient mental health care in this country. If we believe this is an illegal trafficking issue, then we must demand greater enforcement of firearm trafficking laws. If we believe that certain weapons are always mu’ad, we must demand bans on assault weapons and high-capacity magazines. And if we believe, as the rabbis did, that human beings are always mu’ad, we must demand stricter regulations on who can purchase a firearm and when. For instance, the Religious Action Center of Reform Judaism is currently working on legislation that will make it more difficult for stalkers and domestic abusers to purchase weapons. Currently, such provisions only apply to those who have abused their spouses, not to those who abuse their domestic or dating partners, which leaves nearly half of the potential victims completely unprotected. After Shabbat, I urge you to visit the Religious Action Center to show your support for this, and other, legislation aimed at preventing gun violence. NFTY, our youth movement, also has a campaign for gun violence prevention. No, this will not stop every mass shooting, or every act of domestic violence, or every purposeful or accidental shooting of a child. But if our actions could prevent even one unnecessary death or injury, why would we not act? And if we know the dangers posed by our existing laws, and we do not act to prevent even one shooting, what does that make us? Are Bullet Proof Blankets the Solution?